Our patented EZ-SHAMPOO is so simple, fast and comfortable it's head and shoulders above the rest. 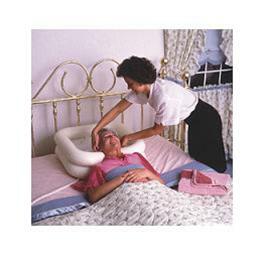 The unique EZ-SHAMPOO inflatable basin fills the need for an easy, refreshing shampoo for patients confined to bed. When inflated by mouth or air pump, the specially designed EZ-SHAMPOO is a secure, form fitting basin that comfortably cushions the patient's neck and shoulders. A conventional drain hose efficiently removes soap suds and water from the basin. All that's required for cleanup is to towel dry the rinsed out sink, deflate, and fold up for prompt storage in a space as small as a folded towel. It's that easy! EZ-SHAMPOO is made of heavy-duty vinyl and is backed by a one year limited warranty. Lightweight and compact in size, EZ-SHAMPOO is 24" wide and 20" long. The 8" deep double-tube design prevents splashing and spilling. Portable shower accessories are also available upon request.